The ebooks@cambridge Service and the University Library is pleased to announce that free, perpetual, full-text access is now available to a defined collection of over 1,350 Peter Lang research monographs. These titles were published since 2010 and have been purchased in print by the University Library. Along with their Open Access monographs the total of accessible ebook titles on the Peter Lang platform numbers just over 2,200. Univesity of Cambridge registered users have access to all titles dispaying a green unlocked padlock and also to those displaying a yellow unlocked padlock icon (the Open Access titles) . You can access the full text in html or PDF format for reading online or by downloading chapter PDFs. Please click on ‘Expand All’ under the Table of Contents section at the foot of each book page to open up the chapter access. All accessible titles are searchable in iDiscover and are available with unlimited concurrency both on and off campus (via a Raven login for non open access titles). There is a publisher-supplied user guide with information on searching, browsing, and citing references which you can access from here. Please contact the ebooks team on ebooks@lib.cam.ac.uk if you have any questions or feedback. Following a recent trial of the Bloomsbury Collections online platform, the ebooks@cambridge Service is pleased to announce that with thanks to the Connell Fund, Cambridge staff and students now have access to 11 ebook collections containing over 400 titles. Anthropology 2016 and Theology 2016 collections are now live on the site, and will be searchable in Librarysearch very soon. All of these activated titles (except for Anthropology 2016 & Theology 2016 – coming soon!) are searchable in LibrarySearch, and registered users can access these ebooks both on and off campus, with a Raven login. Accessible titles are indicated with the unlocked padlock icon as shown. Please contact the ebooks team on ebooks@lib.cam.ac.uk if you have any questions or comments. The ebooks@cambridge Service have organised a free 60 day trial to the ebooks on the Bloomsbury Collections platform, spanning the Humanities, Social Sciences and Law. The site features the latest research publications from Hart Publishing, Bloomsbury Academic, T&T Clark and The Arden Shakespeare, alongside scholarship from historic imprints Continuum, Berg and Bristol Classical Press. You can access the trial platform from here. Click on the Shibboleth login page and select the University of Cambridge, you will then need to enter your Raven login. You can also access the Bloomsbury platform from the ebook collections tab on the ebooks@cambridge website. University of Cambridge registered students, researchers and academics have full-text access to over 4,000 titles, including: various publisher and subject-based Archive & Landmark Texts collections; and the following subject collections; Anthropology, Biblical Studies, Classical Studies & Archaeology, Law, Education, Film & Media Studies, History, Linguistics, Literary Studies, Natural History, Philosophy, Politics & International Relations, Religious Studies, Sociology, and Theology. The Shakespeare Archive 2003- 2012 and The Churchill Collection are also included. The open padlocked icon indicates full-text access. You can see a list of all the collections by clicking here, where a full title list is also available to download. Trial access ends on Thursday 10th December. Please do contact the ebooks@cambridge team with your comments on both the content and the usability of the Bloomsbury Collections ebooks platform; send your emails to ebooks@lib.cam.ac.uk. The University Library is pleased to announce that University of Cambridge users can now access Brill Online’s 2015 published ebook titles across the following 9 Humanities & Social Sciences subjects. The number of ebooks in these collections will increase as new titles are published throughout the year. These titles are available with unlimited concurrency and can be accessed both on campus and if you are away from Cambridge (with a Raven login). Catalogue records will be loaded into LibrarySearch in early February and there will be regular monthly updates. The 2015 collections complement Brill’s HSS 2014 collections and Brill’s Companions in Classical Studies (1) already available to our users on Brill Online. You can also access the Brill Online platform from the ebooks@cambridge collections web page, along with hints and tips. Please contact the ebooks@cambridge team on ebooks@lib.cam.ac.uk with any feedback or questions. The University Library is pleased to announce that University of Cambridge users can now access Brill Online’s 2014 published ebook titles across the following 8 Humanities & Social Sciences subjects. This collection will increase as new titles are published throughout the year. These titles are available with unlimited concurrency and can be accessed both on campus and if you are away from Cambridge (with a Raven login). MARC records will be loaded into LibrarySearch as soon as possible and there will be monthly updates. If you click on the tab you can sort Brill’s ebooks by Title A-Z or Newest Titles First, and filter them by subject. 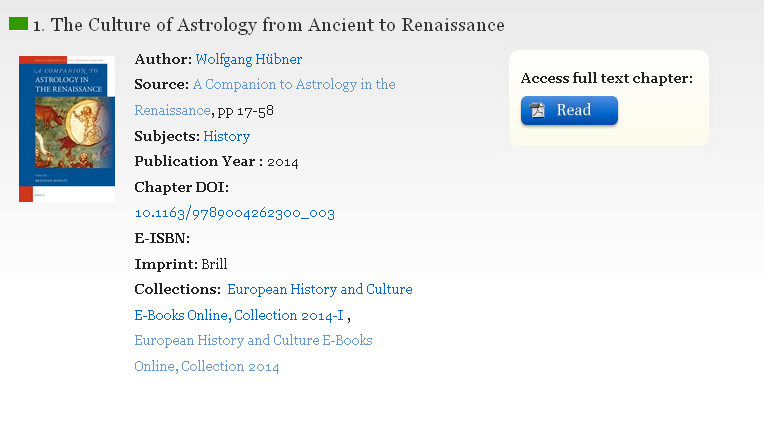 Owned content is marked with a icon and open access content with a icon. 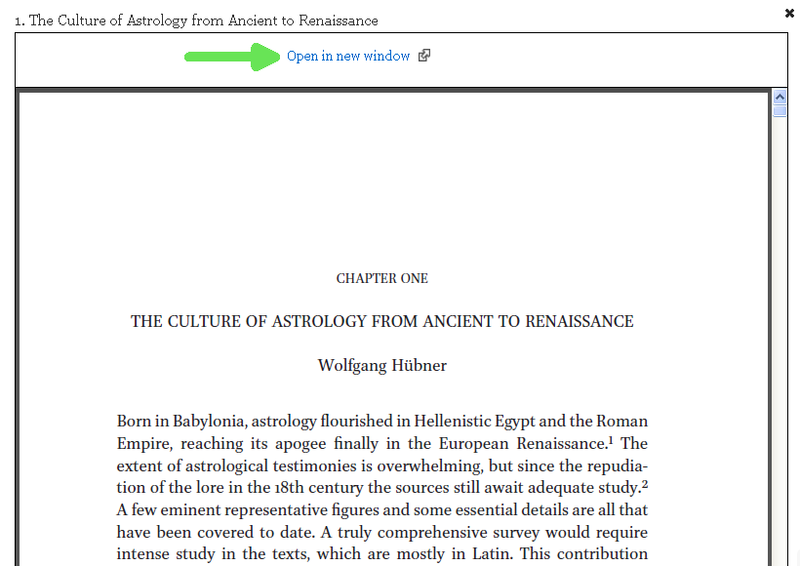 You can open whole books or chapters which display as pop ups in your browser, and by right-clicking you can search in these or print. By clicking on Open in New Window at the top of the pop-up, the document will open as a PDF file which you can print, save or convert to a different format. You can download these PDFs to e-readers, including Kindles. You can also access the Brill Online platform from the ebooks@cambirdge collections web page, along with hints and tips.